A table of a different kind floats up into outer space in the first installment of The Helium Books. 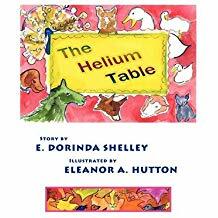 Illustrated by Eleanor A. Hutton, “The Helium Table” establishes the series, with the phenomenon of strange floating objects. When Kath’s mother cleans off an unused dining room table, covered for years by junk mail, books and newspapers, it floats through the door and outside into the sky, with the animals on top of it. BlueInk Review, an independent book review publication, recently reviewed “The Helium Table,” describing it as a “largely entertaining” children’s book that “presents a light and refreshing premise,” abounding in “colorful and dreamlike” artwork. However, BlueInk Review found areas for improvement, including the inconsistent illustrations. Order E. Dorinda Shelley’s “The Helium Table” today through Amazon and Barnes & Noble.